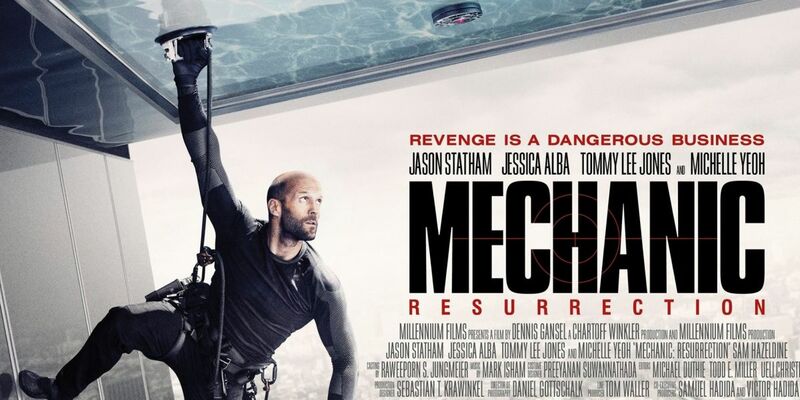 IF YOU’RE LOOKING for mindless, no frills, slambang action, you’d enjoy underrated action star Jason Statham’s new movie, “Mechanic Resurrection”, where he recreates his character, Arthur Bishop, from the first “Mechanic” movie (which is a remake of an old Charles Bronson cult classic.) As a mechanic, Bishop is a hired killer nonpareil whose specialty is to make jobs in killing people look like an accident. When the first “Mechanic” (2011) ended, he’s shown faking his own death so he could retire and live more peacefully. The new movie starts in Brazil, where Bishop live incognito. He is approached by the henchmen of a kingpin, Crain (Sam Hazeldine), to offer him some new jobs. He ends up beating up all of them. He then leaves Brazil and goes to Thailand where he is reunited with a friend, Mei (Michelle Yeoh, wasted in a short supporting role that didn't require her to do anything). It turns out he has a beach house there where he keeps a stash of various weapons. He then meets a beautiful damsel in distress, Gina (Jessica Alba), the battered girlfriend of a bully that Bishop ends up killing. He and Gina fall in love, but it turns out Gina is actually in cahoots with Crain who uses her as a bait to lure Bishop and convince him to do three jobs requiring him to kill three dangerous men. These are African war criminal Krill (Femi Elufowoju) who is in an Alcatraz-like prison fortress, Australian human trafficker Adrian Cook (Toby Eddington) and American arms dealer Max Adams (Tommy Lee Jones), whose character provides the twist in the movie. Bishop has now to kill for love and we see him hopping all around the globe to do this, from Rio to Thailand to Australia to Bulgaria. Jason as Bishop executes his numerous fight scenes capably and persuasively, even when it involves killing an entire battalion of hired goons. He looks leaner here, and also a much more mean killing machine and lone wolf than in his past movies like “Crank”, “Bank Job”, “Home Front” and the “Transporter” series. Despite this, though, he has never been elevated to Class A action superstar status the way Tom Cruise is in his “Mission Impossible” franchise and Matt Damon as Jason Bourne. We think he’s more regarded to be in the same B movie level as Chuck Norris and Steven Seagal. Some folks believe he’d be good as the next James Bond and it would be nice to see what he could do with it since we believe he could interpret it with more persuasion and some finesse. 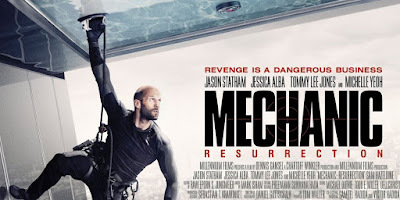 That spectacular scene in “Mechanic Resurrection” is proof that he could be better than Daniel Craig in perfectly executing difficult scenes without a double. We see him using electronic suction cups to climb up to the penthouse swimming pool of his target in Sydney and it is ingeniously staged. He’s shown hanging on his harness, then he drills a hole in the pool’s glass bottom that cracks the glass and we see the bad guy falling right through. 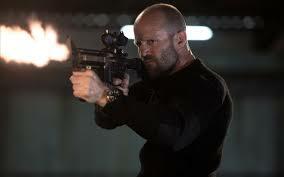 It would be nice to see Jason Statham doing a movie someday that will raise his game and give him more superstar status as an invincible and intelligent man of action. But the first thing he should do is to stop accepting movies that demean him, like his supporting roles in “The Expendables” and “Fast & Furious 7”, and most particularly like his role in “Spy” where comedian Melissa McCarthy simply made fun of him and he allowed himself to be demeaned just for the money.